Atmospheric physicist Nick Gorkavyi missed witnessing an event of the century last winter when a meteor exploded over his hometown of Chelyabinsk, Russia. From Greenbelt, Md., however, NASA’s Gorkavyi and colleagues witnessed a never-before-seen view of the atmospheric aftermath of the explosion. A meteor weighing 10,000 metric tons exploded 14 miles above Chelyabinsk, Russia, on Feb. 15, 2013. Unlike similar past events, this time scientists had the sensitive instruments on the Suomi NPP satellite to deliver unprecedented data and help them track and study the meteor plume for months. Shortly after dawn on Feb. 15, 2013, the meteor, or bolide, measuring 59 feet (18 meters) across and weighing 11,000 metric tons, screamed into Earth’s atmosphere at 41,600 mph (18.6 kilometers per second). Burning from the friction with Earth’s thin air, the space rock exploded 14.5 miles (23.3 kilometers) above Chelyabinsk. The explosion released more than 30 times the energy from the atom bomb that destroyed Hiroshima. For comparison, the ground-impacting meteor that triggered mass extinctions, including the dinosaurs, measured about 6 miles (10 kilometers) across and released about 1 billion times the energy of the atom bomb. 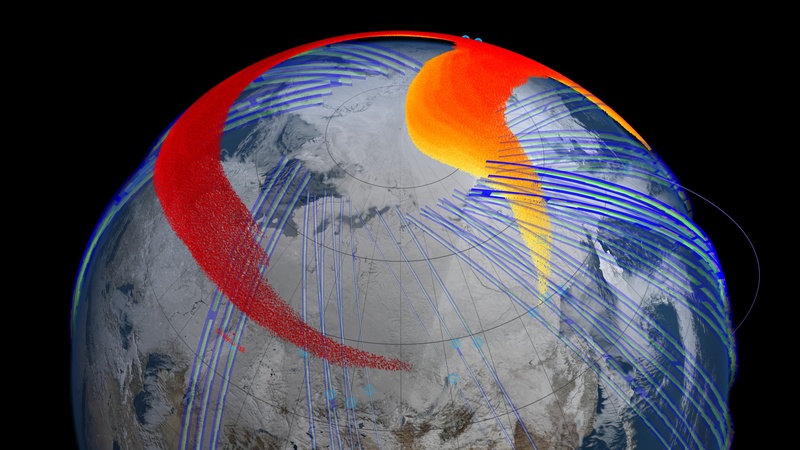 Model and satellite data show that four days after the bolide explosion, the faster, higher portion of the plume (red) had snaked its way entirely around the northern hemisphere and back to Chelyabinsk, Russia. Some of the surviving pieces of the Chelyabinsk bolide fell to the ground. But the explosion also deposited hundreds of tons of dust up in the stratosphere, allowing a NASA satellite to make unprecedented measurements of how the material formed a thin but cohesive and persistent stratospheric dust belt. Gorkavyi and colleagues combined a series of satellite measurements with atmospheric models to simulate how the plume from the bolide explosion evolved as the stratospheric jet stream carried it around the Northern Hemisphere. About 3.5 hours after the initial explosion, the Ozone Mapping Profiling Suite instrument’s Limb Profiler on the NASA-NOAA Suomi National Polar-orbiting Partnership satellite detected the plume high in the atmosphere at an altitude of about 25 miles (40 kilometers), quickly moving east at about 190 mph (more than 300 kph). The day after the explosion, the satellite detected the plume continuing its eastward flow in the jet and reaching the Aleutian Islands. Larger, heavier particles began to lose altitude and speed, while their smaller, lighter counterparts stayed aloft and retained speed – consistent with wind speed variations at the different altitudes. By Feb. 19, four days after the explosion, the faster, higher portion of the plume had snaked its way entirely around the Northern Hemisphere and back to Chelyabinsk. But the plume’s evolution continued: At least three months later, a detectable belt of bolide dust persisted around the planet. The scientists’ model simulations, based on the initial Suomi NPP observations and knowledge about stratospheric circulation, confirmed the observed evolution of the plume, showing agreement in location and vertical structure. The full implications of the study remain to be seen. Every day, about 30 metric tons of small material from space encounters Earth and is suspended high in the atmosphere. Even with the addition of the Chelyabinsk debris, the environment there remains relatively clean. Particles are small and sparse, in contrast to a stratospheric layer just below where abundant natural aerosols from volcanoes and other sources collect. Still, with satellite technology now capable of more precisely measuring tiny atmospheric particles, scientists can embark on new studies in high-altitude atmospheric physics. How common are previously unobservable bolide events? How might this debris influence stratospheric and mesospheric clouds? Scientists previously knew that debris from an exploded bolide could make it high into the atmosphere. In 2004, scientists on the ground in Antarctica made a single lidar observation of the plume from a 1,000-ton bolide.